Business and customer data has existed for ages. Mostly, however, it sat hopelessly trapped in handwritten ledgers, filing cabinets, and floppy disks, a precious resource untapped. The introduction of Data Management Platforms (DMPs) and Customer Relationship Management (CRM) aid the increase of customer data collection so much that 90% of the data in the world today has been created in the last two years alone, according to IBM. With integrated media buying tools, businesses are able to unlock the secrets within their customer data and use it within their programmatic advertising strategy. 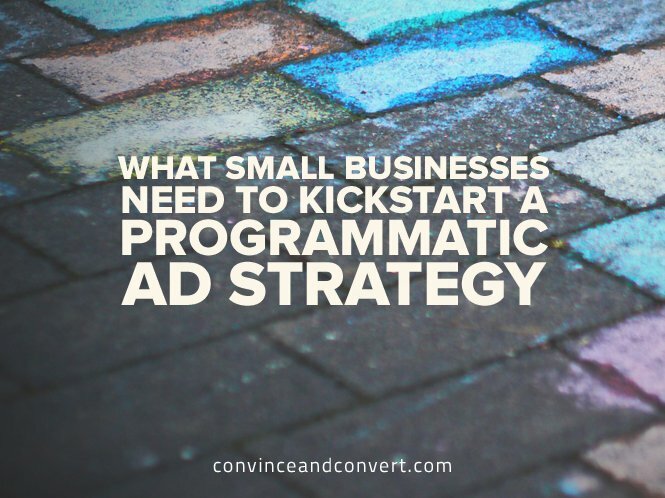 “Programmatic” ad buying can be defined as the use of automation to buy digital advertising, versus the traditional and timely processes of the past. The means by which programmatic ads are bought and sold is through a live auction, on a per-impression basis. This purchasing model provides SMBs with the means to reach their customers and potential customers with a targeted message throughout the buying cycle, regardless of which publisher websites they are visiting. Tying customer data into programmatic media buying creates a powerful digital marketing strategy. Customer data, also referred to as first-party data, paints a valuable picture and enables SMBs with the ability to draw meaningful conclusions about consumers from multiple channels. This type of CRM data can be collected from multiple online and offline sources. For example, retailers can ask for a customer’s email address after an in-store purchase, a travel agent can ask for an email address after a phone booking is made, or a business can segment email addresses of their top customers. Once this data is collected, marketers are now able to unlock the full potential of their first-party data by uploading offline data (such as audience segments in a CRM system) to the online environment—a process called data onboarding or CRM matching. Once there, it can be matched with digital data and activated for a variety of purposes within a data management platform (DMP). CRM matching and programmatic media buying tools enable SMB marketers to target their customers based on their preferences and behavioral patterns in a simple and cost effective manner. In addition, the strategy of using data businesses already have about their customers allows them a way to engage with customers at the right moment along the customer journey and enhance the customer experience—think of a retailer targeting their high-valued customers with an exclusive offer through programmatic media buying. For the greatest ROI, most marketers at small business are turning to customer-focused digital advertising campaigns. Marketers want the ability to reach their high-value customers, target look-alikes, and optimize advertising within the entire customer journey. And that means marketers need a fast, simple, and transparent way to tap into their rich offline storehouses of consumer data to reach their customers wherever they are online. In a survey conducted by Forbes Insight and Turn, they found that organizations that are “leaders” in data-driven marketing report far higher levels of customer engagement and market growth than their “laggard” counterparts. The global survey of over 300 executives found that these leaders are roughly three times more likely to have increased revenues (55% vs. 20%). At the end of the day, successful advertising all comes down to how well you know your customers—not guessing or assuming their behaviors, activities, or intent. In the telecommunications industry, for example, the use of CRM data resulted in online campaigns that were 39 times more effective, according to Neustar. Today, marketers have the ability to bridge the gap between their offline and online customer data with CRM matching, so they can put the right message in front of the right person at just the right moment. But to get there, first they need the right onboarding solution. There are approximately 28 million small businesses in the United States alone, many of whom have most likely not even scratched the surface of the value of their customer data to drive their marketing strategies. Today’s data-driven strategies allow SMB marketers the ability to target customers with more relevant ads. It’s not just about seeing the ad anymore; it’s about the right person seeing your ad at the right time. A seasoned digital media entrepreneur, Andrew Fischer is the CEO and Co-Founder of Choozle, the leading self-service programmatic digital marketing platform which now powers media execution for over 800+ global advertisers. Prior to Choozle, Andrew co-founded and built the RGM Alliance, a premium focused online advertising network that reaches over 120 MM consumers in the US.